This page is for all Biomat orders for U.S.. All products on this page are 110-120v electricity. For all other countries: go to International Orders. Spring Sale: It's time for our Spring Sale! Now until April 27th, 2019, big discounts on the following items: Biomat Aroma Stand, Pro size Biomat Black Canvas Travel case, Queen size Cotton Pad, Pro size Biomat Waterproof Cover, Rejuvena Premium, Alkalife 3000sl Water Filter. Buy One Alpha Max Serum 3.5 or Mega Bio Cleanse and Get One Free. Go here to order. 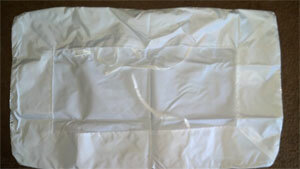 Order securely online or call our Sales Department toll free at 1-877-BioMat-Order (1-877-246-6286). We accept Visa, MasterCard, American Express, Discover and Paypal. Your orders are 128bit encrypted in our shopping cart for secure and safe transactions with your credit card, or you can pay by check or money order, see our FAQs for details. If you have problems ordering with a credit card and the cart shows only Paypal and you want to use a credit card, please give me a call toll free at 1-877-Bio-Mat-Order (1-877-246-6286) or contact us at Sales. Orders for Hawaii must pay sales tax. For information on our returns and repair policy, see our FAQs for details. This package comes with a massage-table size biomat (27.56"w x 72.83"h) 7000mx for all-purpose functionality and ease of mobility. Great tool for massage therapists and chiropractors, it comes with a hard shell travel case with wheels and a bar handle for ease to carry the Biomat, and 100% cotton padded cover. This is an U.S F.D.A. Approved Class II Medical Device. And includes the Amethyst and Tourmaline Pillow which features a therapeutic shape to provide additional support for your neck while comfortably cradling your head. The Professional Bio Mat is also available without the pillow. This is the massage-table size Bio Mat (27.56"w x 72.83"h) for all-purpose functionality and ease of mobility. Great tool for massage therapists and chiropractors, it comes with a hard shell travel case with wheels and handle for ease to carry the Biomat, and 100% cotton padded cover. This is an U.S F.D.A. Approved Class II Medical Device. Only 1 available. This is new biomat, never used. This is extra stock. This is the massage-table size Bio Mat (27.56"w x 72.83"h) for all-purpose functionality and ease of mobility. Great tool for massage therapists and chiropractors, it comes with a hard cloth travel case with wheels and handle for ease to carry the Biomat, 100% cotton padded cover, and new controller. This is the 2013-14 version of the 7000. This does not come with the hard shell case or the added Quantum Energy Layer included with the current 2015 version. This is an U.S F.D.A. Approved Class II Medical Device. The Biomat Mini contains Amethyst and Tourmaline. Tourmaline naturally gives off Negative Ions, and is a cooling stone. This is the perfect take-along for trips, to keep at the office or to share with a friend or family member who would benefit from using this therapeutic device and is great to use in easy chairs, Med-Spa, dental & office chairs. It is also the perfect size for children. Many of our customers have also purchased the Mini-Mat for their beloved pet. The Amethyst BioMat Mini ships with a single control panel, hard shell travel case and 100% cotton quilted cover. Measures 19.69"w x 33.46"h.
Measures 70.87"w x 78.74"h. Comes with dual control to adjust settings on each side seperately. Coming soon: The Orgone Biomat King (220V), Orgone Biomat Queen (220V), Single Orgone Biomat (120V, 220V). The BioMat Quantum Energy Pad is composed of environmentally friendly raw materials such as organic compound energy extracted from peach and grape seeds, which is beneficial to the human body's biological vibration. 6 Layer Structure: Microfiber Fabric Cover, Microfiber Layer, Quantum Energy Layer, Liquid Tourmaline Layer, 3D Mesh Layer (20mm), 3D Mesh Cover (3mm). This is an essential part of Quantum Healing. Our Elastic Polyurethane memory foam pillow features a therapeutic shape to provide important neck stabilization to ensure an anatomically supportive sleep posture. The 100% cotton zip cover can be removed and used as a body wrap for chest, stomach, arms, and legs to assist in relief of many ailments. If you have any questions when filling out the agreement, feel free to contact me. RichWay Detoxi 300Hrs Powder is produced from sun-dried salt that is packed inside the hollow sections of bamboo. It is then heated repeatedly nine times with pure yellow-ocher in a kiln up to 1600 degree celsius. 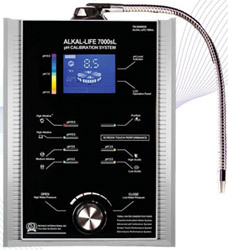 The high kiln temperatures ensure elimination of both, heavy metals and toxins. This process creates a very pure grade of Bamboo Salt that contains lots of essential minerals and micronutrients. It has a high content of Phosphorus, Potassium, Copper, Zinc and Sulfur. Additionally, it has an exceedingly High Oxidation Reduction Potential, making it beneficial for all. 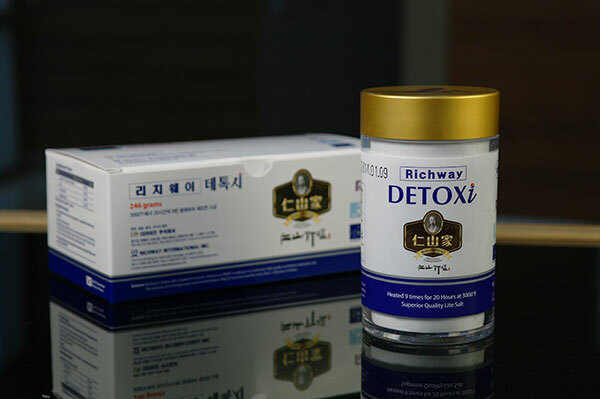 Richway Detoxi 300Hrs is a pure high quality nutrient that is very alkaline, helping balance the cellular osmosis pressure, and is not detrimental like common salt. RichWay Detoxi 300Hrs is very safe. This package comes with a massage-table size Bio Mat 7000mx (27.56"w x 72.83"h) for all-purpose functionality and ease of mobility. Great tool for massage therapists and chiropractors, it comes with a travel case for ease to carry the Bio mat, and 100% cotton padded cover. This is an U.S F.D.A. Approved Class II Medical Device. 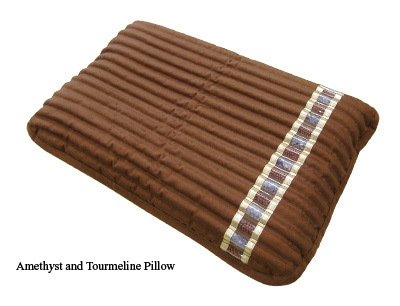 And includes the Bio Mat Amethyst and Tourmaline Pillow which features a therapeutic shape to provide additional support for your neck while comfortably cradling your head. The Professional Bio Mat is also available without the pillow. This is the massage-table size Bio Mat 7000mx (27.56"w x 72.83"h) for all-purpose functionality and ease of mobility. Great tool for massage therapists and chiropractors, it comes with a travel case for ease to carry the Biomat, and 100% cotton padded cover. This is an U.S F.D.A. Approved Class II Medical Device. This page is for all Biomat orders for U.S.. We also ship the Biomat worldwide Canada, International Orders for countries not listed or in the EU, all countries in the EU zone 1, all countries in the EU zone 2, Hong Kong, China, Asia (Singapore, India. Indonesia, South Korea, Philippines, Taiwan, Thailand), United Kingdom, Australia, New Zealand, Norway, Switzerland, Austria, Spain, Greece, Sweden, Germany, South America (Argentina, Brazil, Venezuela, Peru), Guam, US Virgin Islands, Alaska, Puerto Rico, Mexico. **Legal Disclaimer. Information provided is for informational purposes only and is not a substitute for professional medical advice. The Biomat is not a device to cure cancer or any other disease. The Biomat does not claim any medical benefits and does not claim to cure any disease or medical condition. It does not claim any diagnosis or treatment and only claims the statements in the Medical Device of the FDA's regulation. Specific medical advice should be obtained from a licensed health care practitioner. Any information and personal testimonies about the Biomat does not reflect the Biomat's claim.